The temperatures are in the low 60s, but the sun is brilliant and we are following a beautifully landscaped path along the waterfront. 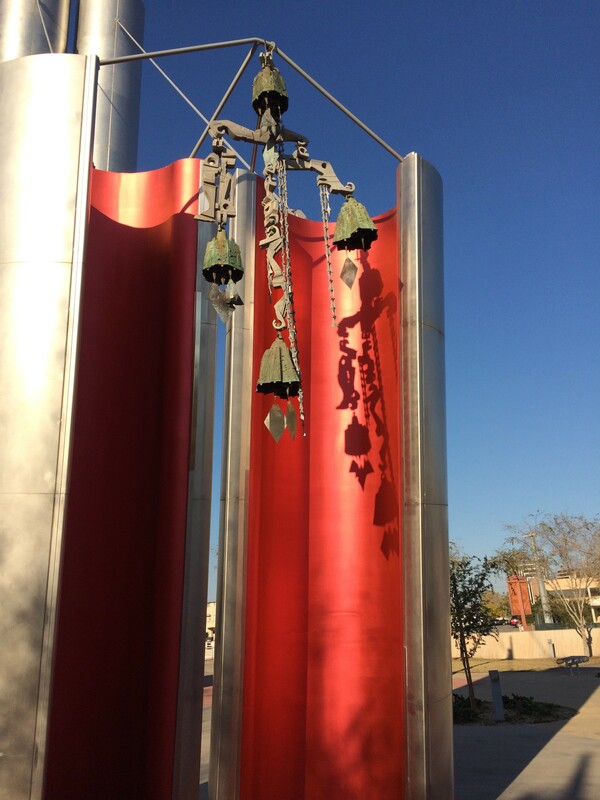 Public art can be found on street corners, in the center of roundabouts, and tucked among the trendy boutiques, restaurants, night clubs and museums. Walkable neighborhoods are just around the corner, and not far away are miles and miles hiking and biking trails that traverse possibly the lushest desert on Earth. Does this sound like Scottsdale, Ariz.? Not quite, you may say, but this formerly one-dimensional town, where all things Western once ruled, has evolved. 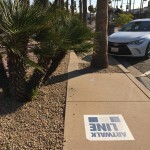 Following these logos on the Scottsdale sidewalks will take you many of the city’s public works of art. And it must be working because the average age of residents has decreased by 10 years, according to the census. 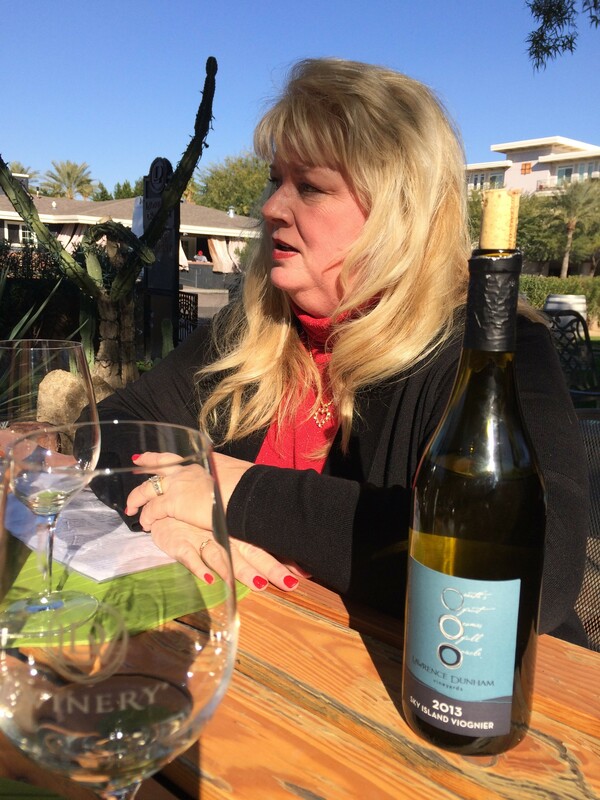 Peggy Fiandaca, co-owner of LDV Winery and its Scottsdale tasting room, explains why Arizona’s southeast corner is ideal for growing red-wine grapes. 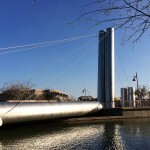 All of this means that today, this city of about 230,000 is positioning itself among other popular southwest cities as a place to be and be seen — a place that offers a laid-back vibe with an equal dose of sophistication. The W has fully signed on to this transformation. Located near downtown at the intersection of Scottsdale and Camelback roads, the hotel is only a short walk from the new clubs, condos and the canal, which is why Scottsdale has a waterfront canvas to build trendy, high-rise housing and shopping malls, as well as 25 miles of paved and unpaved walking and cycling trails. Scottsdale’s Arizona Canal was constructed in the mid-1880s to make desert agriculture possible and later, continuous growth in this sprawling Valley of the Sun. About 40 years later, now-famous resorts began popping up along the 50-mile-long canal. Today, the Arizona Canal is just one of a network of nine that and crisscross the Phoenix Metro area and are managed by the Salt River Project. These 131 miles of canals not only provide the life-giving water, but an easement for 262 miles of trails that take pedestrians and cyclists across the valley without ever encountering traffic. 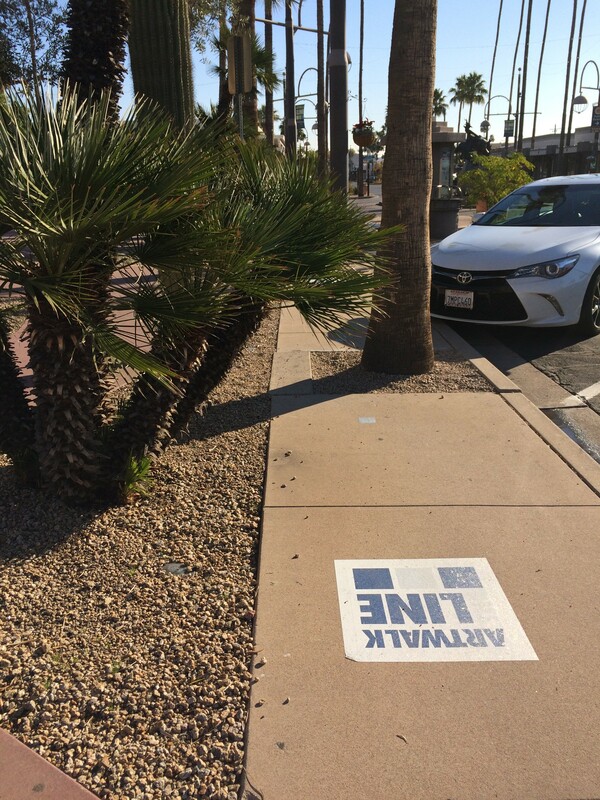 Downtown Scottsdale’s walkability in the opinion of many, is its most attractive factor. 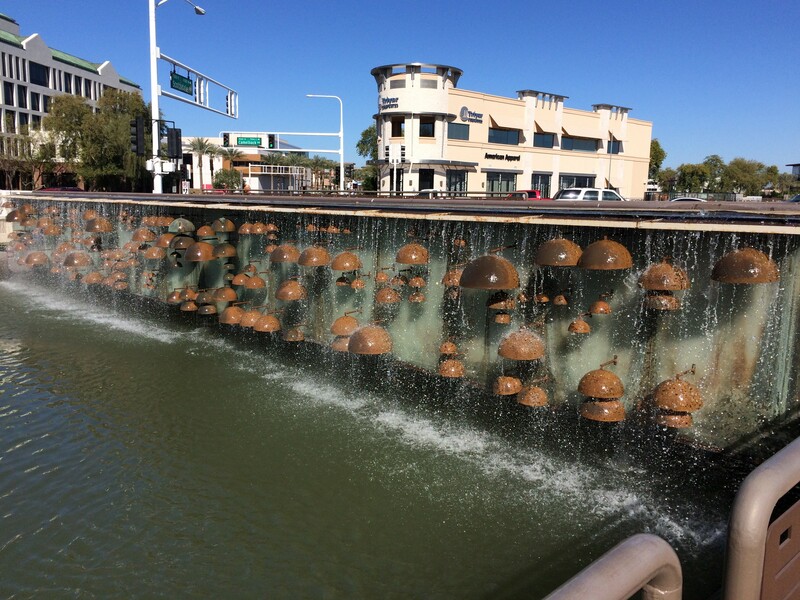 (Downtown should not to be confused with Old Town Scottsdale, which is part of downtown.) Within a couple of square miles are the expected shops, boutiques and restaurants — enough to keep visitors busy for days. Less expected, however, is the Wine Trail, a route that includes tasting rooms that feature Arizona wines (really). 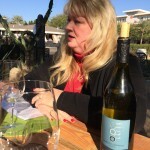 On an unusually cool January afternoon, we are seated on the charmingly shaded patio of LDV Wine Gallery in the company of vineyard owner Peggy Fiandaca. She explains that LDV’s 14 acres are located in southeast Arizona, a three-and-a-half hour drive from Scottsdale. 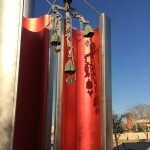 These Goldwater Bells, created by artist Paolo Soleri in 1969, once hung in the Corcoran Gallery in Washington, D.C., and the now-gone Goldwater’s Department Store in Scottsdale. Arizona has 100 wineries (really) in three grape-growing regions, most at an altitude of 4,000 feet and above. The regions are Verde Valley north of Phoenix; and Sonoita-Elgin and Willcox in the southeast. Willcox earned its American Viticultural Area designation last year. 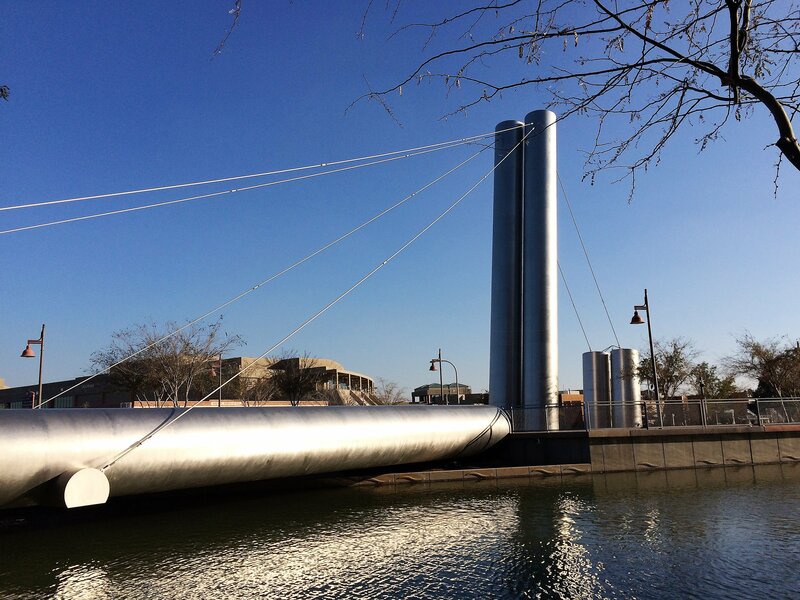 Like it or not, this stunning bridge, designed by famed artist Paolo Soleri, is an eye catcher for visitors to Downtown Scottsdale. The towers at the far end of the bridge shelter a surprise – the Goldwater Bells. LDV Grenache, for which Arizona, according to the knowledgeable, is highly suited to growing. “We focus on reds because the conditions are right — and we like reds,” Fiandaca explains. Need any other excuses to visit Scottsdale? How about Major League Baseball’s spring training season (Feb. 24 to April 21)? Sixteen teams play in 10 stadiums throughout the Valley of the Sun. Visit cactusleague.com. Visitor information about Scottsdale: ExperienceScottsdale.com; and the W Scottsdale: wscottsdalehotel.com. 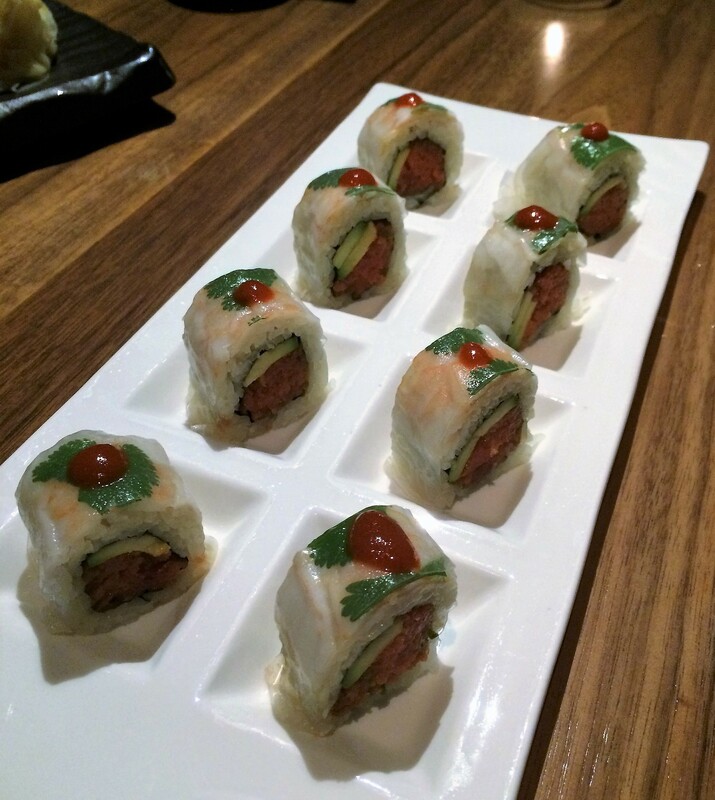 This sushi platter, the culinary artwork of chefs at Sushi Roku restaurant at the W Scottsdale hotel, is too pretty to eat…but we did. 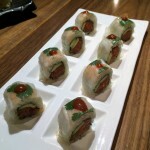 For more photos of Scottsdale, visit facebook.com/elouise.ondash. Next column: Scottsdale’s green desert and small-but-mighty museum.